If a piece of toast covered with jelly falls to the floor, which side will it land on? This was the question we broke into groups to answer as part of our “Science Ambassador” training. As a librarian, I am used to referring to reference sources, print or online, to answer such questions. But that choice was not available, as trainers from DESE (Department of Elementary and Secondary Education), the Museum of Science in Boston, and WGBH wanted us to learn by doing. We broke into small groups and used the materials at hand, including index cards and paper clips, to form models to test our theories and then shared back with the full group. I hadn’t had quite that much fun at a professional development event in a long time, which gave me pause to reflect on the obvious fact that if we as educators are embracing a playful, curious, animated approach to learning in our PD sessions, our students will surely benefit by that strong level of vitality and enthusiasm for learning that we carry back into our classrooms and districts. Literacy skills are critically connected to building knowledge in science. Reading in science requires attention to detail, the capacity to make and assess intricate arguments, synthesize complex information, and follow detailed procedures and accounts of events and concepts. Students also need to be able to gain and interpret knowledge from diagrams and data that convey information and illustrate scientific concepts. Writing and presenting information effectively are important means for students to assert and defend claims, demonstrate what they know and convey what they have experienced, reflected upon, and learned. 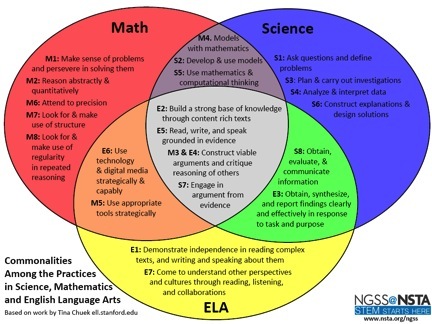 Connections to ELA CCSS are included across all disciplines and grade bands in the final version of the NGSS. NGSS standards are written in three dimensions including crosscutting concepts, a disciplinary core idea and a science and engineering practice. Core ideas are key understandings that allow students to interpret and explain the world around them. The focus might be on natural phenomena (ex. mass of a tree, carbon cycling, climate change) or designed systems (ex. energy or transportation systems). The core ideas progress in sophistication from the pre-K to 12 levels, and emphasize the use of key concepts over lists of facts, parts, or process steps. The outcomes of integrating practices and content include better reflection of actual science and engineering, increased mastery of sophisticated subject matter, increased relevance through using practices in authentic contexts, and increased interest in STEM (America’s Lab Report, NRC, 2005). Beyond the shared goal of instilling inquiry/research skills in our students, other strong reasons to partner across subject areas include a sharing of the planning, curriculum development and resources. Collaborating is also more fun, both for ourselves as educators and for our students, who benefit by seeing the connections across discipline areas. My library science intern this year created a visual literacy lesson to complement a high school biology unit on genetic disorders. Students learned how to effectively illustrate pedigrees and Punnett squares using Google Draw, Progeny and Piktochart. Students were introduced to thought provoking visualizations related to genetics, and then had the opportunity to provide context and make connections before creating their own visuals. In addition, they were instructed about the importance of citing sources. Multiple learning goals were met through this engaging, cross-disciplinary lesson. Ms. Collins has worked as a Media Specialist/Librarian for 14 years. She is currently a library media specialist at Sharon High School, where she has worked for the past four years. 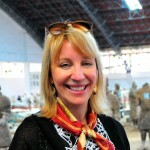 She began her career as a reporter who covered business, arts and education-related issues. While interviewing the headmaster at a private school, she realized that she wanted to combine her love of research and writing with a career in education. At that point, she returned to school for a Masters in Library Science and further graduate studies in educational leadership. Ms. Collins has published her writing in various journals including “Library Media Connection,” “NEA Today,” education-related blogs and websites including AASL’s “Knowledge Quest.” She is a 2012 Reynolds High School Journalism Institute Fellow and project consultant for the E-Book, “Searchlights and Sunglasses: Journalism in the Digital Age.” She received a “Teachers for Global Classrooms” fellowship from the U.S. State Dept. in 2014 and is the recipient of AASL’s Intellectual Freedom Award (2014) as well as a “Super Librarian” award bestowed by MSLA (Massachusetts School Library Association). She is a Massachusetts Library System Executive Board Member and has served on the MassCUE Board as PD Chair since 2013 along with the NEISTE Board. She earned National Board Certification as a Library/Media Teacher in 2009. In her spare time, she enjoys nature walks, reading, travel and yoga. You don’t need to do research, just apply one of the Unnatural Laws “the chances if bread falling buttered side down is directly proportional to the cost of the carpet! A great though-provoking post. Thank you for sharing! I would love to see more posts like this one on Knowledge Quest- longer, more substance, and more illustrative examples.